Southwark Council’s Cabinet has said it will be prepared to use Compulsory Purchase powers to remove retailers from the Elephant & Castle shopping centre, to enable its redevelopment by its owner Delancey. The Cabinet has also said it plans to conduct an Equalities Impact Assessment (EqiA), which will look at how the redevelopment of the shopping centre will affect various stakeholders including Black and Minority Ethnic (BME) retailers. As a result of Lord Ouseley’s Inquiry, Southwark pledged ‘to place itself at the forefront of best practice in enterprise development, provision of business support services for SME/BME traders and businesses and planning and regeneration activities, which give priority to local communities at every stage of prospective development proposals and new initiatives’ (para 42); and in 2007 the Council’s Executive approved a ‘Traders Charter’ setting out detailed policies on how traders would be secured tapered rent subsidies not just on the retail in the new shopping centre but all new S106 retail and also Southwark’s own commercial retail premises in the area. There is a lot that is questionable about this. First, traders have been pretty much left in the dark for the last decade about what is going on, a fact no better illustrated than by this turn of events – didn’t Southwark think it would be a good idea to ask them what they thought of Delancey’s CPO request? 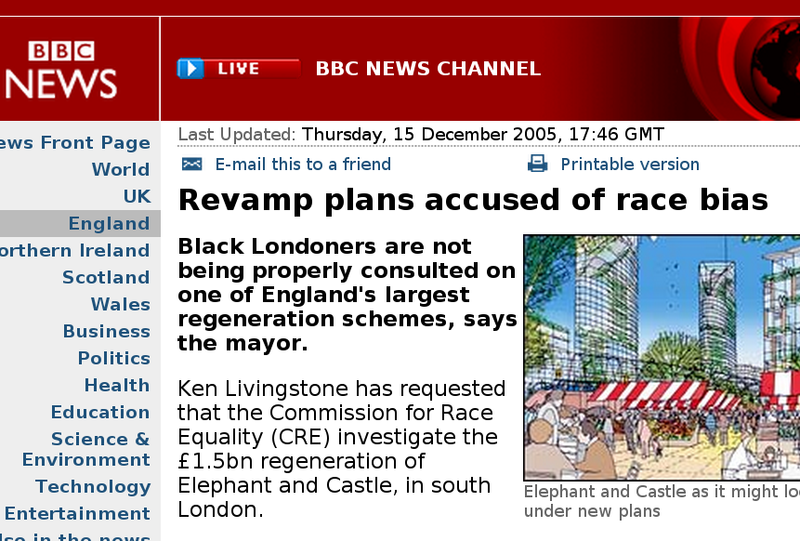 Second, Southwark has carried out EqiAs before, on the Heygate estate and the Aylesbury (68% BME), which failed to prevent the mass displacement of these local BME communities; the big danger is the shopping centre EqiA will just be another routine bureaucratic exercise to satisfy CPO procedural requirements. Third, while getting the CPOs isn’t in the bag yet for Delancey (Southwark will have to consider another report before a final decision), they will nonetheless have a much strengthened bargaining position with any hold-out leaseholders/freeholders (none of whom have named). The Land Registry shows that whilst most are on short leases, there are a handful of traders in the shopping centre with long leases as well as the superbowl, bingo hall, Charlie Chaplin pub, newsagents and dental practice on New Kent rd. There are also the traders in the railway arches who will need to be removed in order for Delancey to realise its plan to open the arches as access routes. Delancey’s consultation on the redevelopment of the shopping centre has so far been extremely poor. It has not engaged with the shopping centre traders as a community in the way that it should, and has offered very little to the SME’s that make for the centre’s diversity. Instead it is relying on its power as landlord to clear the centre through termination of shorthold leases and the Council’s CPO powers for those it cannot terminate. As a local planning authority that has required the demoliton of the shopping centre for planning purposes, Southwark has a legal responsibility to the traders and everyone who uses the centre under the 2010 Equalities Act. It must carry put a proper EqiA - not just a tick-box exercise, and must make it clear to Delancey that unless it makes adequate provision for the retailers in its plans, it will not get its CPO.